See also: Cross Lane Barracks, Salford ; The Militia Barracks on Eccles New Road, Salford. 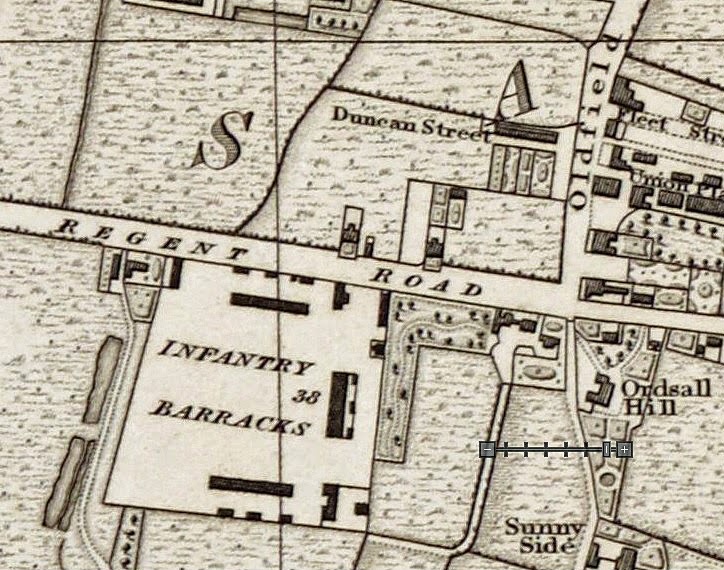 Construction of the Salford Infantry Barracks on Regent Road began on 1 November 1819. This date is significant, occurring only weeks after the Peterloo Massacre, which took place on 16 August 1819. To place the disposition of this military installation in its wider historical context, we need to consider events before and after this bloody confrontation. The Age of Enlightenment left a legacy of ideas promoting personal freedom, equality, societal reform and democracy. These ideals resulted in the American Revolution (1776) and the French Revolution (1789). Such politically radical events were threatening to the British ruling class. who responded with various repressive measures designed to arrest the spread of political reform. Their apprehension was heightened by incidents like the Despard Plot, the March of the Blanketeers, and various other riots and unrest. The period following the Napoleonic Wars was one of severe economic distress. The cost of the conflict with France left Britain with a national debt of £848 million. Many suffered high taxes, negligible political representation, stagnant wages (Luddism), skyrocketing food prices (exacerbated by the Corn Laws) and poor living conditions, especially for the burgeoning working class. In protest, tens of thousands of people from Manchester, and its surrounding areas, assembled peaceably at St. Peter's Field. The government was alarmed, and responsed with force. Mounted militia,  with sabres drawn, slashed and trampled the unarmed crowd, littering the field with hundreds of wounded and dead bodies. The massacre was followed by more repressive laws and arrests. 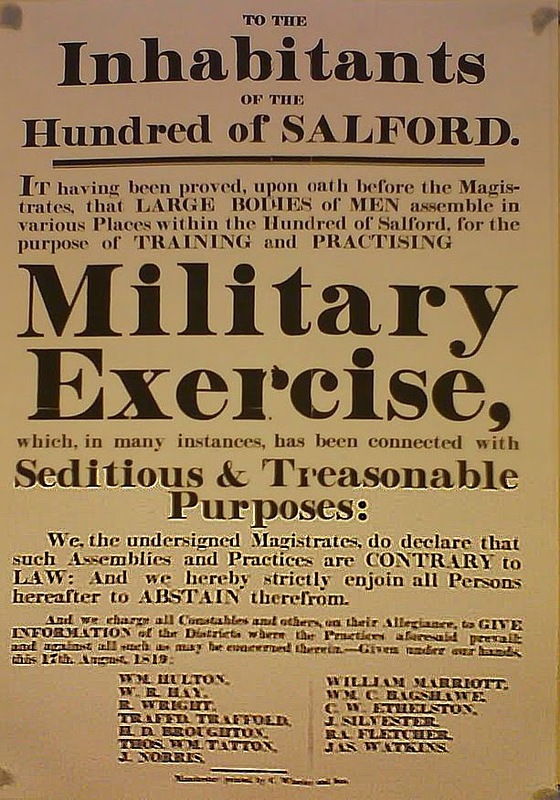 On the day after the Peterloo Massacre the following poster was issued. 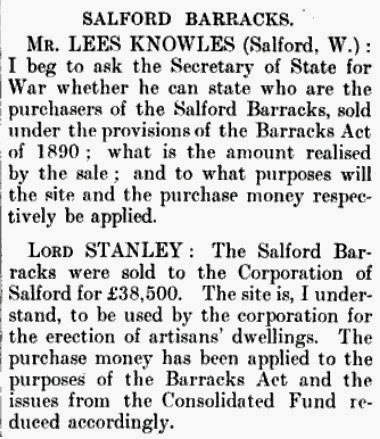 When we consider the events above, it seems reasonable to conclude that the initial purpose of building the Salford Infantry Barracks was that its garrison could be used to quell any potential insurrection that might arise in the district. Even as late as 1881, a company of the 8th Infantry, stationed at the Salford Barracks, was used to suppress a mob of angry miners at Howe Bridge, Atherton. The following shows the regiments, or elements of regiments, that were stationed at the Salford Infantry Barracks. 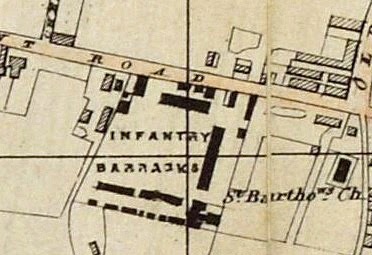 Unless otherwise noted, much of the information has been gleaned from the church records of nearby St. Barthomew, Salford (founded in 1841 on Oldfield Rd.). The dates reflect those given in the records for baptisms and marriages, and do not represent the duration of unit deployment at the barracks. However, they do provide a useful framework. After the Childer's Reforms of 1881, some soldiers continued to use their old regimental designations. 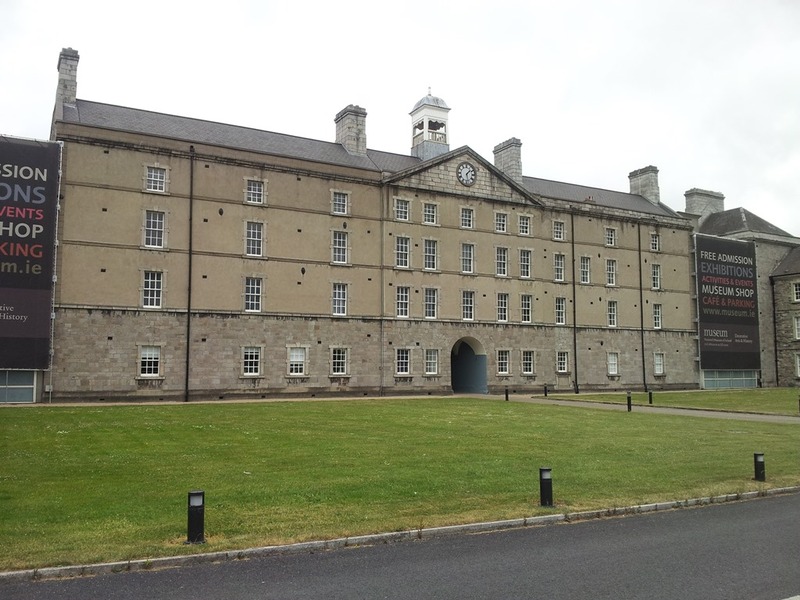 A new 96th was raised five years later on 6 February 1824 at Salford Barracks, Manchester. It was allowed to carry the battle honours awarded its predecessor - Peninsular, Egypt and the Sphinx. A detachment [of the 2nd Battalion] of the 60th Rifle Corps, stationed at Salford Barracks, was involved in an accident on the Broughton Suspension Bridge crossing the River Irwell. William Wilmore, stationed at the Salford Barracks, was court martialed on 18 June 1832 for desertion, and transported to Australia 24 August 1833. December 1842 to May 1843. 1843 8th Regiment of Foot. 1879-1880 11th (North Devonshire) Regiment 1st Btn. 1881 8th Regiment of Foot. 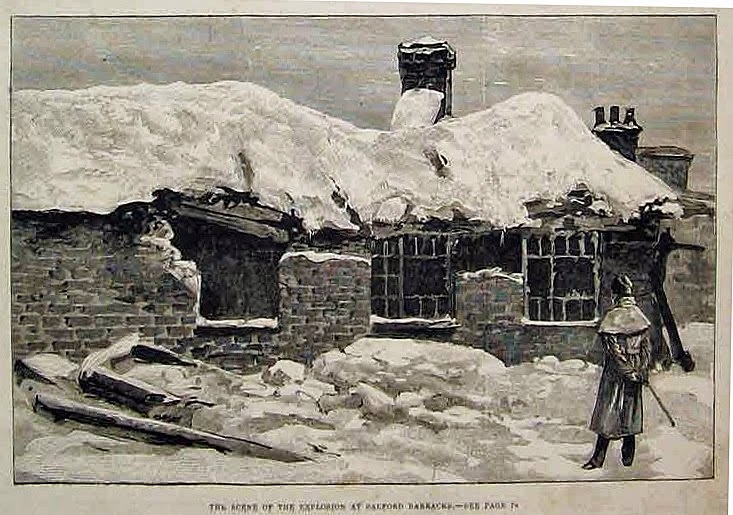 The bombing of the Salford Barracks on 14 January 1881 was the opening shot of the Irish Republican Brotherhood's campaign against the Crown that lasted until 1885. The British newspapers of the day referred to the Irish nationalists as Fenians, which included a cadre of Irish-Americans. Their guerilla offensive is known to historians as the Fenian Dynamite Campaign. The regiment at Salford Barracks during the bombing of 1881 was the 8th (The King's) Regiment, which some sources refer to as the 8th Light Infantry. Consequent to the Childers Reforms, the 8th (The King's) Regiment was renamed the King's (Liverpool Regiment on 1 July 1881. An account of the bombing is recorded in their regimental history. 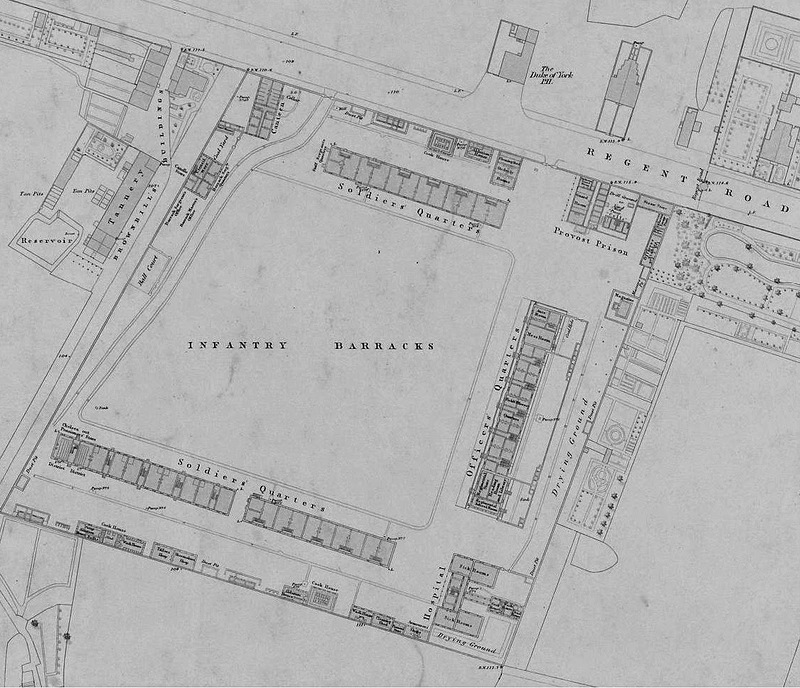 "The following removal of troops [of] the northern district take place below —2nd battalion of the South Staffordshire Regiment stationed at Salford Barracks, Manchester, will proceed to Liverpool..."
"The barracks at Salford have such unsatisfactory drainage that they cannot be occupied without very considerable reconstruction."
. 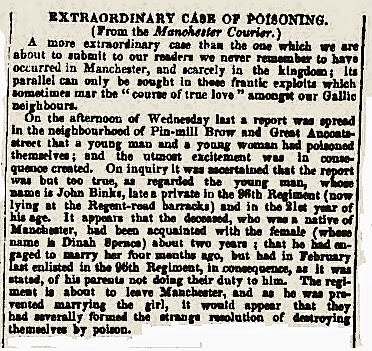 It appears that the sewage system was so bad that the barracks were vacated and the garrison moved to Hulme Barracks on 30 April 1896. Apparently, only a 4-inch drainage pipe was laid in 1850 to service the barracks. The hospital facilities were also found to be substandard. "... the New Barracks Estate, Salford which was built between 1900-1904 on the site of a former early C19 infantry barracks. The estate was Salford Corporation's first housing scheme, and not only provided housing, but also community buildings, including Salford Girls' Institute (destroyed during WWII), Salford Lads' Club (1903, Grade II) and the Church of St Ignatius." 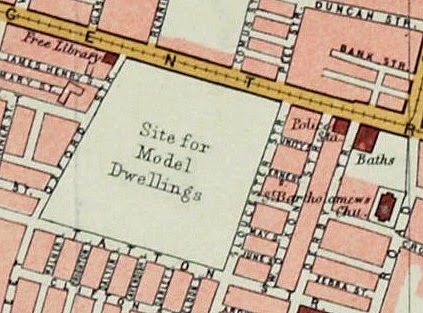 The Housing Authority (1910) planned to build 108 4-roomed working-class houses on the 10 1/2 acre 'Barracks Site', anticipating rents between 5/11 and 6/3 per week. 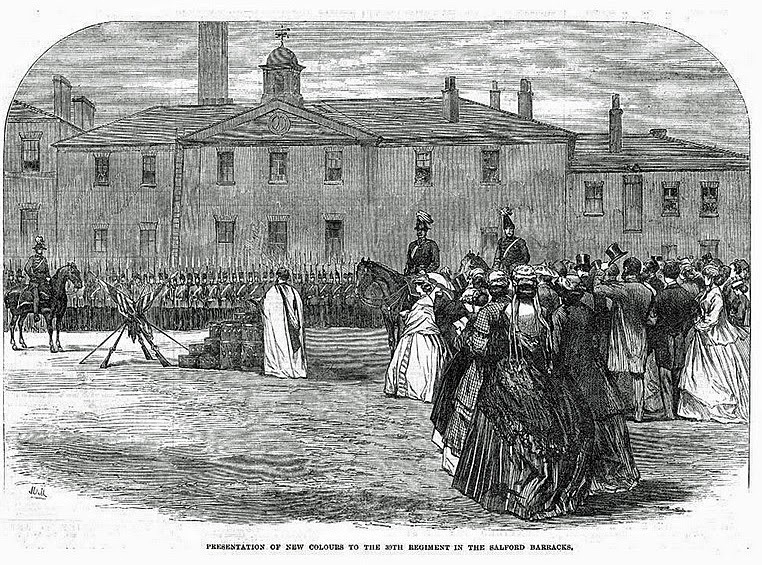 The Salford Infantry Barracks seen above (Illustrated London News 1866) shows that it was built in the neoclassical style, and is reminiscent of the earlier Collins Barracks, Dublin. The She Battery was a dangerous and poverty-stricken area opposite the Salford Infantry Barracks. The 'She Battery' Mob, a gang of scuttlers, flourished around 1870.